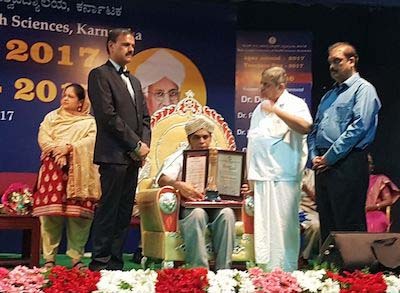 KANKANADY.OCT.6: The eminent and best teacher award in the field of Homoeopathy and health education is awarded by Rajive Gandhi University of Health Sciences Bangalore Karnataka To Dr.R. Munir Ahmed. Vice Chancellor, Members of Senate, Syndicate and Academic council of RGUHS Karnataka honoured Dr. Munir Ahammed for his outstanding contribution to academic achievement in health science education an inspiring young minds as a teacher par excellence on Teachers Day. The Teachers’ Day was celebrated at RGUHS, Karnataka on 26th Sep 2017. Dr. Nagendra, an eminent Yoga expert and Chancellor of S-VYASA Deemed University, Bengaluru was the Chief Guest.